Edward IV of England. An affable young man, who grew into an inconveniently strong-minded king. In retrospect, the Earl of Warwick may have misjudged the young man he persuaded the court of England to crown King in 1461. 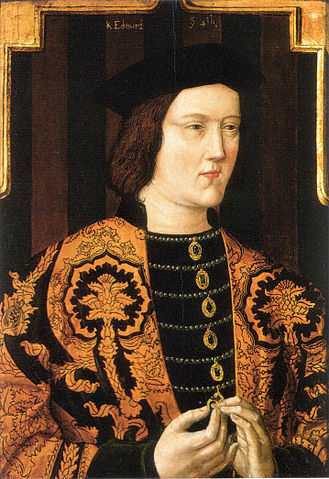 Edward of York, who then became Edward IV, was only 19 at the time, with a reputation for affability, and Warwick may have thought he would be easily led. Or he may simply have seen this as his only option to avoid capture and execution by the Lancastrians, following the death of his cousin Richard of York. Regardless, he used his influence, and the actions of the Lancastrians in violating the Act of Accord, to have the young Edward made king. And for a while, this went well for him. The two men led the field at the Battle of Towton, where the Lancastrian menace was broken. After the battle, Edward returned to London for an official coronation, while Warwick remained to pacify the north. This he did very effectively. 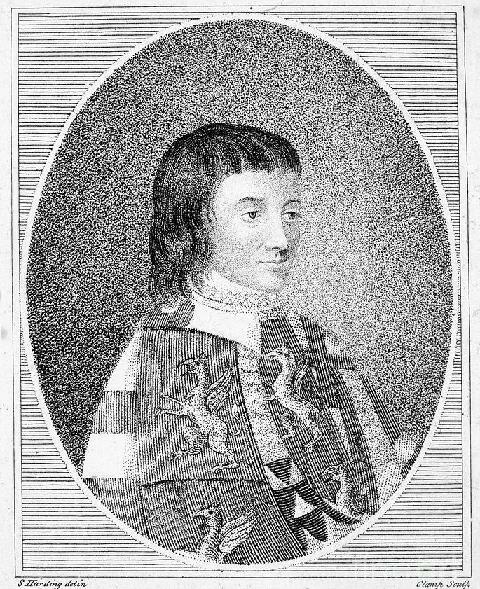 Richard Neville, 16th Earl of Warwick. His actions in placing Edward IV on the throne earned him the sobriquet “Kingmaker”. Two years later in 1863 England made a peace treaty with Scotland. This severely undermined the few remaining Lancastrians, as Scotland had always been their refuge and ally in the conflicts, and now they had nowhere left to turn to. The remaining Lancastrian forces gathered in Northumberland, near the town of Hexham. John Neville, brother of Warwick, led an advance force ahead of the King’s main army, racing to attack the Lancastrians before they could properly prepare, and managed to rout them against the river. As was always the case when an army was forced to retreat into water, the casualties on the Lancastrian side were enormous, and the leadership of the Lancastrian campaign was wiped out – as were its finances, when the war chest was captured. Henry VI himself escaped and hid in the Pennine mountains for a year, but was eventually captured by the Yorkists. He was imprisoned in the Tower of London – but very deliberately not killed. 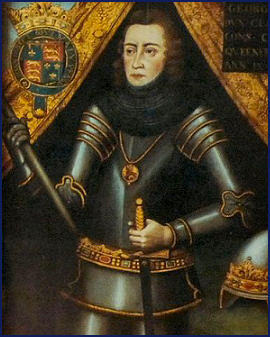 Although a living Henry was a risk for Edward, who was, after all, his successor, he was preferable to giving the far more dynamic Edward of Lancaster a direct claim to the throne. So Henry was put into a dungeon, and largely forgotten. Nery’s flight from Hexham was merged with Towton by Shakespeare. Meanwhile, however, Warwick was beginning to feel his influence at court, once absolute, slipping away. First came the matter of the King’s marriage. Warwick was convinced that a dynastic alliance with a European monarchy was a matter of necessity, and in fact had (without the King’s knowledge) already made an informal agreement with King Louis XI of France that Edward would marry his daughter Anne. However, Edward threw a spanner in the works by announcing that he was already married. He had secretly married Elizabeth Woodville, the widow of a Lancastrian knight and a relative of Henry VI on her mother’s side, a year earlier. When Warwick found out that he had been left looking like a fool on account of the King marrying a commoner, he was outraged. In this, he was not alone. Virtually the entire court thought that the King was a fool for this alliance, which was seen (disparagingly) as a love-match. 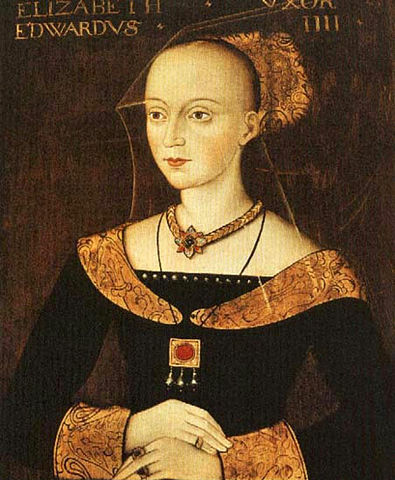 Elizabeth Woodville, the widow who snared the heart of a king. Worse for Warwick was the sudden influence that the Queen’s family suddenly found. Elizabeth had a large family, and all were naturally given titles. Most notable was her father, Richard Woodville, who was made (in quick succession) Earl of Rivers, Lord Treasurer and Constable of England. He and Warwick soon disagreed over the subject of the marriage of the King’s sister Margaret – with Warwick once again favouring the French, while Woodville pushed the notion of an alliance with Burgundy. This turned even more against Warwick when the King signed a secret treaty with Burgundy, but forced Warwick to continue sham negotiations with the French. Finally, the King refused to allow his younger brother George to marry Warwick’s daughter Isabel. This angered both men, and the wedding still took place in 1469 – but secretly. The two were not ready to defy Edward openly just yet. The Lancastrian military cause had been crushed, but Queen Margaret and Prince Edward were still at large, and the two still inspired conspiracy against the King. Taking advantage of this undercurrent of dissatisfaction, Warwick secretly sponsored a rebellion against the King in the north of England. The rebellion was nominally led by “Robin of Redesdale”, but the name Robin was a common alias for rebels, and it is definite that whoever this Robin was, it was Warwick pulling his strings. This was confirmed when the rebels began spreading rumours, saying that Edward was illegitimate, and that George was the true heir to the throne. The King gathered an army to stop them, but both underestimated their force’s size and overestimated the amount of troops he could muster – especially when George and Warwick declared for the rebels. 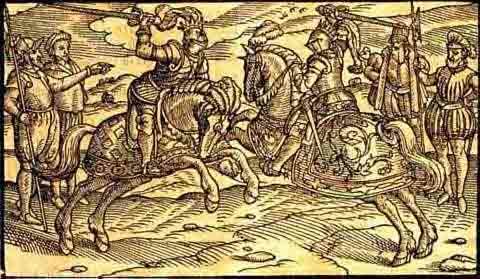 They caught the King’s army on the march on Edgecote Moor, and defeated them. Robin of Redesdale was reportedly killed in the fighting, but this had little effect on the rebel army – he had served his purpose. 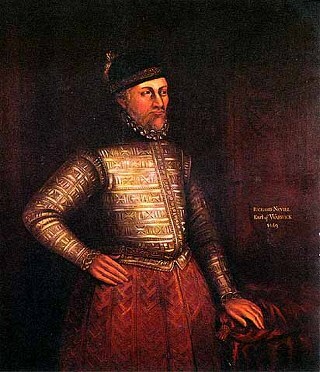 Sir Richard Woodville, the unfortunate first Earl Rivers. His death did not spell the end for his family – his son Anthony would continue to be a force within the court. With the king’s army defeated, Warwick was in control. Both Richard Woodville and his son John were caught by the rebels and murdered. Warwick’s brother, the Archbishop of York, took Edward into custody. However, Warwick found that he could not rule without the King, nor could he persuade the court to make George king. Popular disorder finally forced Warwick to release the King, and the two men fell into a chilly detente. Tensions remained high, however, and Warwick decided that his only option was to arrange for the King’s death so that George could take the throne. To accomplish this, he arranged for rumours of civil unrest in his home base of Lincolnshire to reach the King’s ears. When the King mobilised his forces to restore order, Warwick then spread rumours among the people of Lincolnshire that this was a police action to root out those who had rebelled under Robin of Redesdale, that their pardons had been revoked and the King meant to make an example of them to discourage future rebellion. With the King unaware of the size of the opposition he faced, Warwick then had one of his men, Sir Robert Welles, organise a resistance against the king, building a force of locals. At news of the size of the rebel armies, the King issued letters of commission for other nobles to raise armies – including Warwick and George, who raised armies, but then marched them to support the rebels. The battle between Edward and Welles’ forces is known as the Battle of Losecoat Field. Popular etymology says that this came from the defeated soldiers discarding their uniforms as they fled, but it is more likely to come from the Old English phrase “hlose-cot”, or pigsty, as one was near the battle. Welles, however, had little control over his troops. When Edward realised that the irregulars had failed to rendezvous with Warwick and George, he planned an attack. The two armies met near Stamford, where the two lines assembled. The King then had Welles’ father brought out and executed. This enraged the rebels, who charged, but who immediately broke when fired on by the King’s cannon and charged by his men. Welles was captured, as was his correspondence with Warwick. Welles confirmed the conspiracy before his execution, and Warwick and George were declared traitors. They fled the country, going first to Calais where Warwick had found sanctuary before. This time, however, the Captain of Calais remained loyal to the King, and Warwick was forced to flee to the French court, where his multiple failed marriage negotiations had at least earned him contacts. However also in residence at the court of France was Margaret of Anjou. At the King of France’s instigation, the two reconciled and made common cause against Edward IV. The Earl of Warwick, who had made the young Edward a King, was now allied with his mortal enemies. The final attempt of the House of Lancaster to regain its power was on. 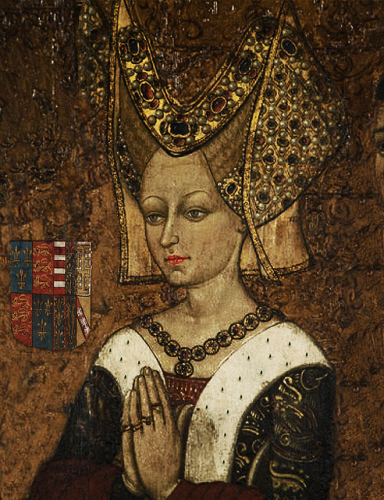 Queen Margaret, unmellowed by age and still determined to see her son on the throne of England.